Our Aluminium,UPVC and PVCU bi-fold doors including brands such as Smarts, Beaufort and our exciting Concealed Hinge Doors are completely bespoke, being made to measure after our professional qualified survey, fitting perfectly into openings of any size and are available in a huge range of colours and opening configurations. 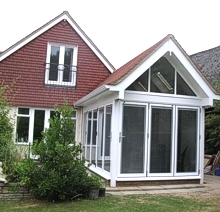 Great Prices, Quality Products, Experienced Fitting Services provided since 1984 by Complete Bi-folds UK. A family run business that puts its customers first and prides itself on service as shown on our CPA report opposite. The Beaufort System 'Slim Line' Bi-folding door with a low threshold option (just 22mm step over) has a concealed drainage feature that interfaces with external drainage channels. Designed with the input of Belgium expertise, we believe that this is one of the very best all round folding doors on the market. With over a 90% aperture this 'Slim Line' Bi-folding door will literally transform your living space. 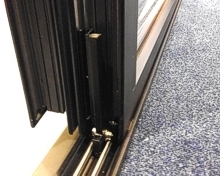 More information on the Beaufort Bi-folding Door System. The Smarts 1000 Bi-fold door system has been designed to bring a graceful elegance to your home, they allow for over a 90% clear opening - bringing the outside in, and are very competitively priced, with very slim profiles to minimise frame and maximise the glazing area. 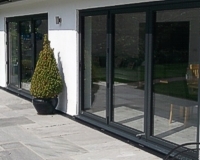 Widely recognised by most installers as one of the best Bi-Folding doors on the market today. The doors are manufactured using the unique POLYAMIDE thermal break system supplied by SMARTS. This superior system guarantees excellent performance coupled with unparalleled insulation and excellent long-term reliability. More information on the Smarts 1000 New Generation Slimline Series Bi-folding Door System. The Smarts New Slimline Bi-fold door system has one of the slimmest meeting styles on the market today at only 108mm. More information on the Smarts New Slimline Bi-folding Door System. These brand NEW bi-folds have no unsightly hinges breaking up the clean lines of the doors, and the intermediate door handles are recessed into the profile. The specially engineered hinges are fully concealed when the doors are closed, resulting in a clean, tidy and contemporary look. Widely recognised by most installers as one of the best Bi-Folding door systems on the market today. 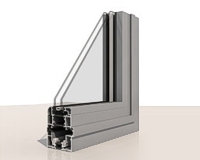 More information on the Emperor Concealed Hinge Bi-fold Door System. 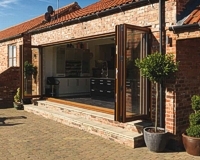 Our superb collection of UPVC bi-fold doors offers market-leading aesthetics, engineering and value. An attractive and contemporary alternative to French doors or Patio doors, they discretely fold back open to create an area of space and introduce vast amounts of light. When fully retracted, they create up to a 90% open space, turning your outside area or patio into another useable room. Doors can be manufactured up to an impressive six metres wide, offering a simple yet stunning way to enhance your environment. However, because every home is unique, we offer a choice of folding options, allowing you to choose how your door works. This maximum versatility helps you to enjoy and expand your home in the way that works best for you.